Revolution Slider Error: Slider with alias PAAM/Slider not found. Harders Cabinetmakers specialise in commercial and domestic cabinet making, kitchens, vanities, bars, all types of furniture and much more. 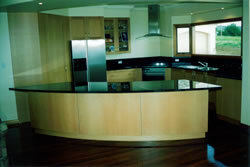 We are the experts in the jobs the other cabinetmakers say are too hard or can’t be done. We are located in Port Lincoln, South Australia and service the Eyre Peninsula and West Coast regions. Harders Cabinetmakers are the solid timber specialists, making all our own solid timber doors onsite, so we can offer you a personalised design in a door. Let your imagination run free. We also offer specialty paint finishing. The perfect job starts with your imagination and finishes with our expertise. We have been serving the local community since 1981 and partner Paul Harders has over 30 years experience. Commercial and Pleasure boat fitouts. 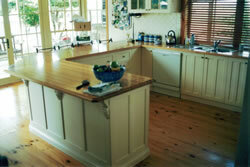 Harders Cabinetmakers make free standing furniture, in traditional and modern designs. Let your imagination run wild. We also offer a wide range of specialty paint finishing.